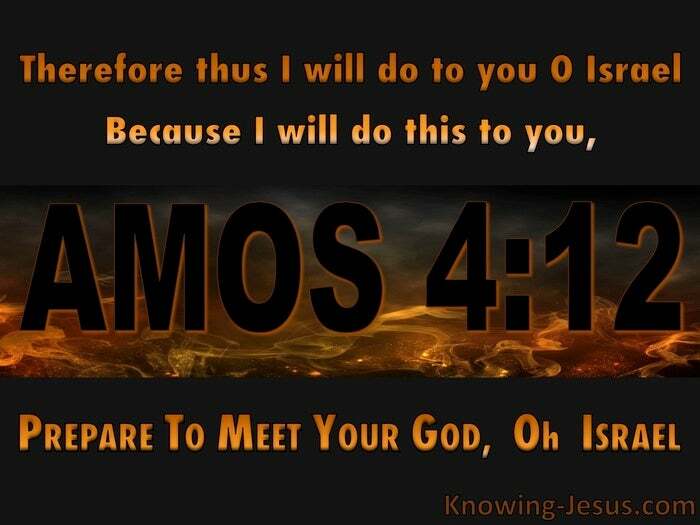 What Does Amos 4:12 Mean? God is long-suffering and full of loving-kindness and mercy, and it is not His desire that any should perish, but that all men should repent and turn to Him - but when wickedness and evil is multiplied.. when superstition and immorality abounds.. when idolatry and idol worship has contaminated a society and the repeated call to repent is ignored and ridiculed.. there comes a time when God must carry out punishment on an evil and perverse generation. Israel were God's chosen people and had a unique relationship with Him, which made their sin against Him all the more serious. And so we read in the book of Amos and other prophetic scriptures.. the call for Israel to repent of their sin and turn from their idolatry, or suffer the consequences of their ongoing rebellion. God had clearly laid out through Moses the conditions of His covenant with his people Israel in their wilderness wanderings, after He brought them out of the land of Egypt... And although God remained faithful, long-suffering and full of loving-kindness towards His chosen people, they became unfaithful.. blasphemed His name, ignored His commands, refused to trust His Word and fell into shocking idolatry and apostasy. The time had come for judgement to fall upon the house of Judah and the house of Israel - and so Amos is called to deliver these chilling words to God's rebellious people - Prepare To Meet Your God, O Israel. God's people had experienced numerous warnings from God, not only through the words of the prophets but in the form of famine; earthquakes; drought; blight; plagues; wars and other devastating catastrophes in an attempt to call them as a nation to repent of their sin and turn back to the Lord. 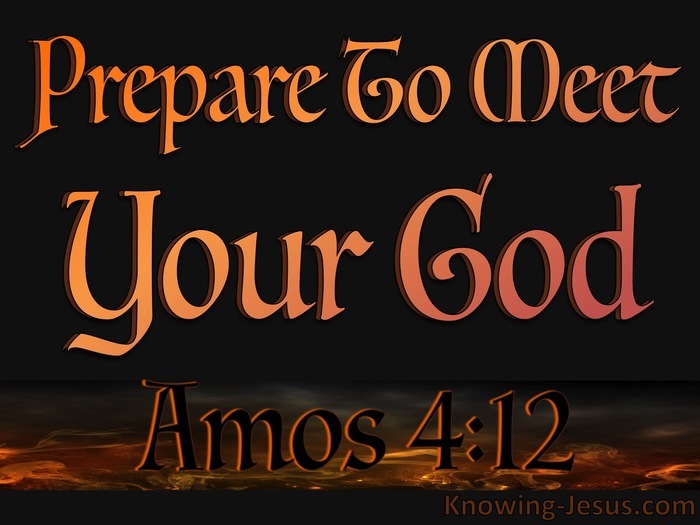 But despite the warnings they were given and the discipline they experienced they would not turn away from their idolatrous ways, and Amos was called to deliver these chilling words: Prepare To Meet Your God. Because the repeated chastenings of the Lord had been constantly resisted and ignored.. God pronounced judgement on rebellious Israel and her idolatrous neighbours. But how like the society in which we live, where ungodly perversions are encouraged and proudly paraded,.. blasphemous law are passed in the corridors of power, corrupt leaders are honoured and rewarded for their depraved acts and profane people foolishly flaunt their devious and demonic behaviours - unaware or unconcerned that judgement is at the very door and that the warning words: 'Prepare To Meet Your God' are imminent. The doorway of this day of grace has been standing open for 2000 years for whosever will repent of their sins and turn to the Lord.. and be saved by grace through faith in the death, burial and resurrection of the Lord Jesus Christ - but that open door into full forgiveness of sin and life everlasting is soon to be closed and the floodgates of God's wrath are soon to be poured out on a God-hating, Christ-rejecting, sinful world in a coming time of terrible judgement - as foretold by the prophets of old. Every person whether Jew of Gentile will one day meet Him - but they will either stand before Him in grace or in judgement. 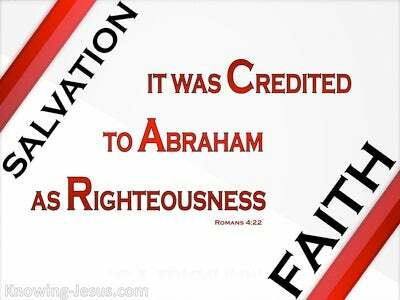 They will either be judged as forgiven saints or unredeemed sinners for all are either positioned 'in Christ' or positioned 'in Adam' - all are either clothed in Christ's righteousness or clothed in their own unrighteous acts. Let us continue to sound the alarm of God's approaching judgement to those that are lost in their sin and blinded to the truth.. and pray that in His wrath God will graciously remember mercy - knowing that the day is coming when those that have rejected His offer of salvation and free gift of eternal life.. will have to stand before His great white throne of terrible judgement and have to face an eternity without God - and without hope. 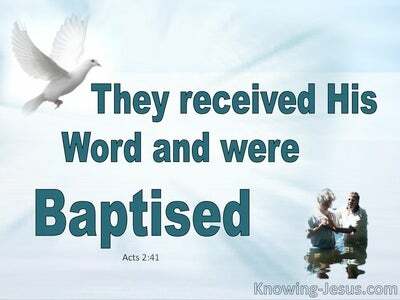 We then, as ambassadors for Christ, beseech you: be ye reconciled to God. Now, in the accepted time. Now is the day of salvation. We entreat you to repent and be converted and prepared to meed your God - that your sins may be blotted out, and that you may turn 'to serve the living and true God, and to wait for His Son from Heaven' and be unblameable at the coming of our Lord Jesus Christ. Heavenly Father, there are many today who are unaware that the day of grace is soon to be closed and that they will one day have to stand before Jesus Christ as their Saviour OR their Judge. 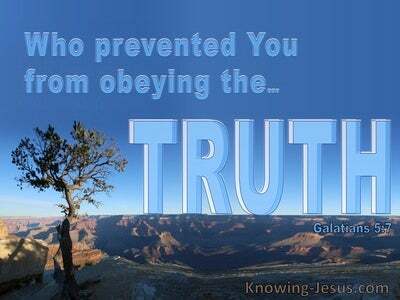 Thank You that we have been saved by grace because Jesus took the punishment that we deserve upon Himself. 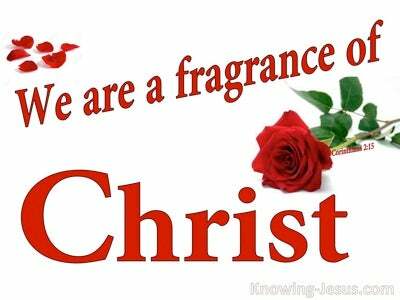 Thank You that Jesus was judged in our place.. so that we would not have to face Your wrath .. but have received forgiveness of sin and life everlasting. We pray for the multitudes that do not know You or who have deliberately refused to recognize the truth and repent of their sin and we plead the blood of Jesus for their forgiveness.. We pray that in Your wrath You will remember mercy and bring many into the kingdom today.. by grace through faith in Jesus Christ our Lord - in Whose name we pray, AMEN.